The Plan is named after Ehud Prawer, Netanyahu’s director of planning, who headed the Prawer commission which discussed planing issues in the Naqab. The Prawer’s recommendation were approved by the government in September. Two weeks ago Prawer’s bill passed first reading in the Israeli Knesset. For Palestinians the Nakba was never a one time event that happened 65 years ago. It’s an ongoing tragedy, ethnic cleansing and colonization never stopped. Implementing Prawer Plan, with whatever justifications Israel gives, should be viewed in that context. The struggle to stop Prawer Plan should be massive and powerful, confrontation with the state is inevitable. This is not just the struggle of Palestinians 48, its the struggle of all parts of the Palestinian people against the same power that keeps us divided, continues to colonize our land and transfer our people, whether in lands occupied in 1967 or in 1948. 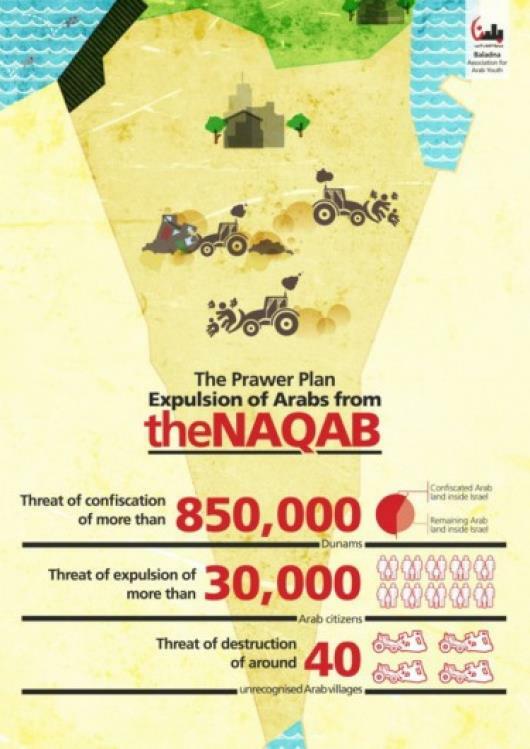 Prawer plan is also a good example for those questioning “Apartheid” in Israel and praising it’s “democracy”. It’s about time you understand that concrete action is needed, join Palestine solidarity movements and support efforts to Boycott, Divest and place Sanctions on Israel. Call to action: you can raise awareness and mobilize in your city to stop Prawer Prawer plan. Organize protests, events, BDS actions etc. Jdaydeh, Maker, Kufr Yasif, Ayadeiyeh junction. Majd Alkroum, Deir Alasad, Be’neh, Majd Alkroum enterance. Sunday July 14th 8:30pm Haifa, Emil Habibi Square.